The summit of Cerro Mojon Rojo gives us the chance to appreciate the granite massif of Fitz Roy & Torre, as well as a number of spectacular glaciers. This ascent includes the experience of crossing an area of ice with crampons and ropes. The activity starts with a hike from El Chaltén towards Laguna de los Tres on the popular and beautiful marked trail. We'll pass through a leafy lenga beech forest, past Laguna Capri and Poincenot Campground, before we turn off the main trail and hike towards Laguna Sucia. After a trek of around 5 hours, we Bivi in a cave with an incredible view of Fitz Roy and refuel, ready for a big day tomorrow. After a substantial breakfast at first light, we begin our final ascent. First we will be hiking and scrambling over boulders and rivers towards the glacier. After 3-4 hours, we will hike over the glacier using progression techniques and suitable equipment (harnesses, crampons and ropes, etc.). From here we will scramble and climb to the summit of Cerro Mojon Rojo. 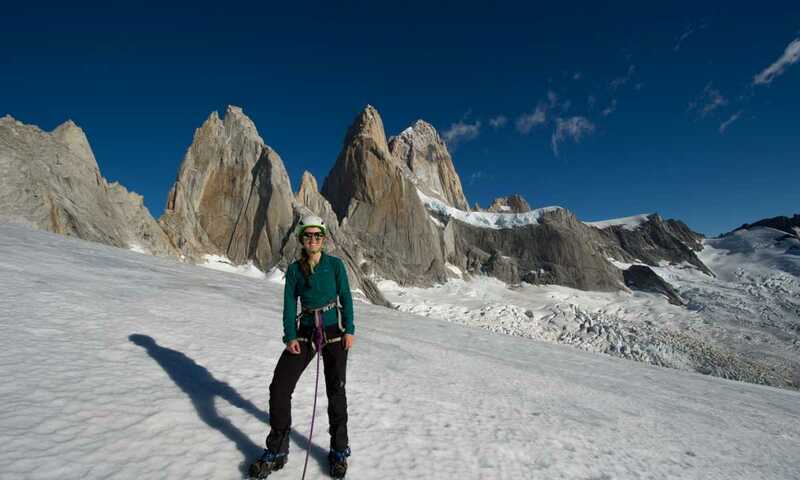 After enjoying the marvellous views of both Fitz Roy and Torre from the top of this spectacular peak, we descend retracing our steps along the same route to either Bivi once again in the cave, or camp lower down at Poincenot Campground. Today we have a more leisurely start, and slowly make our way down the last of our route towards El Chalten. This trip can run as a group trip, with prices starting from $925 per person for a complete group. If you are looking to join a group or you are a solo traveller we will help to form likeminded groups of travellers. Please let us know your travel plans.